The second Kate Moss for Topshop collection is now available at Nordstrom. The edgy yet sophisticated collection includes pieces in both dark and light colors, as well as bold and subtle prints. Embellishments and bohemian details add just the right touch, without seeming overdone. If you plan to shop the Kate Moss for Topshop collection in store, customers who spend $150 will get a Topshop tote. 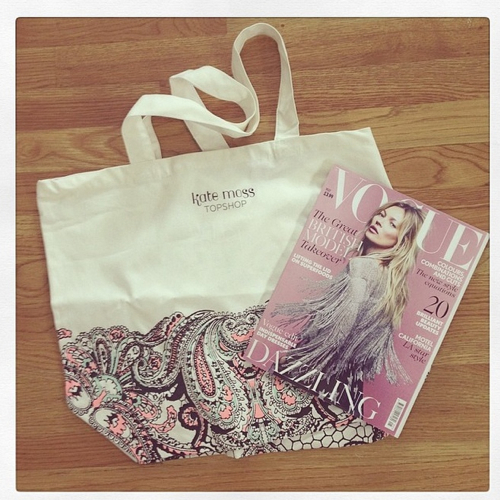 The first 50 totes are filled with Topshop Lip Paint and a copy of April’s British Vogue. Here’s the StyleCarrot Instagram of the tote and mag. The Lip Paint’s headed out to my new intern, Liza Howard, who assembled this post.